Learning programmable logic controllers (PLCs) can be fun when users are able to make connections with familiar control systems like conveyer belts and traffic lights! 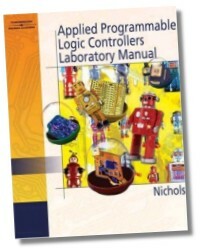 This innovative Lab Manual uses projects and examples that are based on everyday automated control systems to provide readers with a clear understanding of the "hows" and "whys" involved in the use of latches, timers, counters, sensors, relays, and more. A comprehensive introduction to ladder logic diagrams and PLCs sets the stage for more than 50 project-based lab exercises that effectively expose users to a number of control situations for active, "hands-on" learning. Dr. Daniel Nichols is a Professor at DeVry University in Chicago, Illinois.